Enter for a chance to WIN and Apple or Android watch on INSTAGRAM - ends February 28th. 1.) follow the CushingHubApp on Instagram. Post a picture of a Cushing high school sporting events or screenshot from our live broadcast. 2.) Use the (#CushingHubApp) with every picture for an entry. And tag or share with 10 friends. 3.) post as many post between. Jan. 29-Feb 28 2019. Each post will be one entry for a chance to win. Head-to-head, Cushing and Tuttle split four matches on the final day of the individual wrestling state championships in Oklahoma City. Jake Ahrberg defeated Tuttle’s Harley Andrews 9-8 in the 160-pound title bout and Gage Hockett squeaked out a 3-2 win in tiebreakers against Tuttle’s Kavan Guffey to win at 182. Tuttle took the other two matches Saturday, as well as its 11th straight overall championship, as Cushing became the only team to really give the reigning champs a challenge in 4A. Cushing finished second in team points with 96 – more than double what it tallied a year ago. A disciplined, patient Cushing pushed its season to the brink Friday before bowing out in the regional tournament. The Lady Tigers, playing in the Class 4A varsity basketball regional in Kingfisher, lost to Elk City in a plodding contest that bled into an overtime period. Cushing was looking to extend its streak of area tournament qualifications, having come off a district loss and then slammed Harding Charter Prep on Thursday. Intensity was high on defense, from start to finish. With the ball, Cushing seemed to play with a death grip in the final quarter, desperate to keep possession and wait until the best shot presented itself. The Lady Tigers came from behind to force the overtime period but couldn’t get the ball into the lane in overtime. They lost 53-47. Leaning on his team’s ability to improvise on offense, coach Brian Busby embraced a patient, toe-to-toe battle in the final minutes against the Elkettes. Rachel Sherwood, Nevea Skinner and Lola Nanaeto kept the ball out of enemy hands as Braelyn Berlowitz worked against double-teams in the lane. Elk City denied low passes, however, and Cushing couldn’t regain control as the clocked ticked down. The Lady Tigers were forced to foul, and Elk City made free throws. Berlowitz ended with 14 points, Nanaeto had 13, Regnier 10, and Franklin (8) and Carrier (2) combined for the rest.It marks the first time since 2016 the Lady Tigers will not be in this week’s area tournament. The Lady Tigers overwhelmed their opponent Thursday from the beginning, taking an early 20-4 lead and cycling players in and out of the game frequently.Harding Prep couldn’t contend with Cushing’s size as Berlowitz, Rachel Sherwood and Ariya Regnier were constantly in position for rebounds on both ends of the court. Cushing led 32-14 at half and committed only three fouls. Berlowitz had 23 points and Regnier was next with 10. Six others scored in his game for Cushing as the Lady Tigers cruised into the second round of the regional tournament. The boys did not get through their first-round regional opponent. They lost 65-60 Thursday to Harding Charter of Oklahoma City. Tyler Hurst exploded for 30 points, even scoring 10 times in the second half. Caleb Tull had 15. Cushing 55, Harding Prep 27 Cushing (17-8): Berlowitz 23, Regnier 10, Carrier 9, R. Others 3, A. Others 3, Nanaeto 3, Sherwood 2, Skinner 2. Harding Prep (14-13): Cole 14, Martinez 9, Rivera 4. Friday, Feb. 22 Elk City 52, Cushing 47 (OT) Cushing (17-9): Berlowitz 14, Nanaeto 13, Regnier 10, Franklin 8, Carrier 2. Elk City (16-11): Southard 24, Flowers 9, Butler 8, Miller 7, Butle. Harding Prep 65, Cushing 60 Cushing (10-14): Hurst 30, Tull 15, Melson 4, Crooks 4, Jones 3, Cummings 2, Guerrero 2. Harding Prep (10-15): Toca 25, LaDay 20, McKinney 8, Robinson 6, Rhone 6. RDMGtv will begin broadcasting a schedule of spring sports. Beginning with Soccer on March 14th, LIVE from O’Dell Field, as the Lady TiGERS Soccer team tries to duopkicate last season with an appearance in the playoffs again this year! 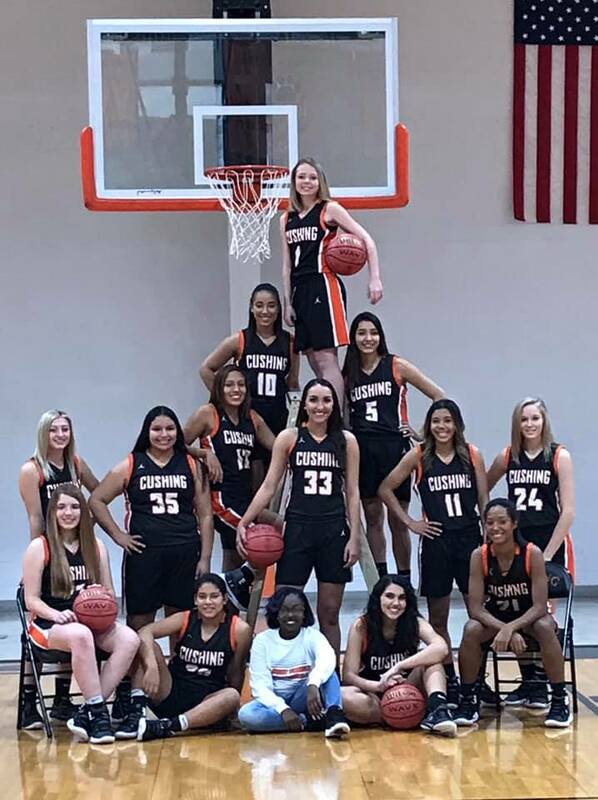 CUSHING – On the opening night of the Class 4A varsity basketball playoffs, Cushing’s girls had the challenge of hosting the state’s second-ranked team. Classen School of Advanced Studies (SAS), nicknamed the Comets, came into Cushing’s gymnasium with a 24-1 record and a monthlong undefeated streak. A nifty layup, a steal, and six more easy points prompted Cushing coach Brian Busby to burn his first timeout 2 minutes after the tipoff with his team suddenly trailing 8-2. “There should have been five or six timeouts in that first quarter,” Busby said. “I was just trying to settle us down, get us focused on what we wanted to accomplish.” Cushing came out of that early timeout looking for a patient approach. It didn’t come naturally. A minute later, Classen’s Morgan Kennedy hit a 3-pointer from the right side, and Jordan Harris quickly stole the next pass to glide in for a layup, stretching the lead to 13-2. The Comets cruised to a 59-28 victory to advance to the winner’s bracket of the regional tournament in Kingfisher. “It’s a game of runs, we know that,” Cushing senior Braelyn Berlowitz said. “They got on a roll and we were trying to get a steal, slow them down. 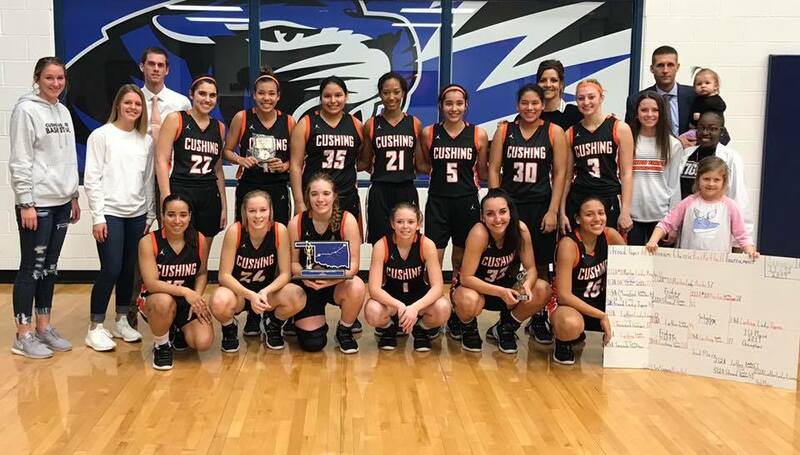 We struggled.” Berlowitz finished with 7 points to lead the Lady Tigers along with Lola Nanaeto on a night when the pace never slowed enough for Cushing to get comfortable. Rose Others scored five, Ariya Reginier had four, and three others combined for the few remaining points. For years, this Cushing girls basketball program has been known for its defense. The girls on this team are aware of that tradition, and they anticipate a quick recovery from Friday’s loss. “We always rely on our defense,” Berlowitz said. “Coach told us in the locker room after the game that every time we’ve lost this season, we’ve come back to win three in a row.” Win three in a row, and the Lady Tigers will advance to Area. They advance to regionals despite the loss. They will play at 1:30 p.m. Thursday in Kingfisher against the loser of Friday’s Kingfisher vs. Harding Charter game. Ben Patrick hit a 4-pointer on a half-court shot designed to drain the clock and give Classen the final shot of the first half. It was a deep one, and it gave the Comets (12-13) a nine-point lead. It was all Classen from there as Cushing (10-13) made second-half runs but couldn’t cut the deficit within double digits, losing 58-47 in the Friday nightcap. The girls and boys teams will advance to the Kingfisher regional as district runners-up, where the bracket becomes single-game elimination. On Tuesday, Cushing’s girls traveled to Berryhill for their third-straight win. They won 42-36. The boys lost 58-54 with yet another thrilling fourth quarter. This time, though, the last-second heroics that lifted them against Cleveland were missing in a tight finish. The game put the 10-12 cap on a regular season that saw the Tigers grow more resilient each week. Follow CushingHubApp on Instagram for a chance to WIN - see our Instagram page for details…. CUSHING – The can’t-miss Tigers made senior night memorable. With 2 seconds left and the score tied at 63 in Friday’s final home game against Cleveland, Caleb Tull flashed his hands in front of Slah Guerrero near Cushing’s bench and caught the inbound pass. Coach Jontue Ezell had drawn up a plan, and there was no time to think, just act. Slipping past his defender and leaping to dodge another, Tull – a senior – flicked a 3-point-shot off the backboard and watched as he floated down. It banked in. With a buzzer-beating 3-pointer in his final home game, Tull lifted Cushing to a 66-63 victory and sealed its fourth win in the last five games. No doubt shocked, a handful of Cleveland’s players started arguments in front of Cushing’s bench, forcing Ezell to break up a scuffle after the winning shot. The Tigers have two dates left on the regular-season schedule and an 8-10 record overall. Districts begin Friday, Feb. 15. Before then, Cushing will travel to 3A’s 17th-ranked Sperry Pirates on Saturday, Feb. 9, and then to Berryhill (10-12) Feb. 12. Friday marked the boys’ highest-scoring game, as well. Their previous best was a 61-51 victory against Jones on Jan. 26. On Tuesday, Cushing rallied to a convincing, 51-27 win against Perkins-Tryon. Again by the skin of their teeth, Cushing’s girls pushed through a miry win Friday night. They defeated a 10-win, 12-loss Cleveland team 38-28 as they continued a patient march toward playoffs. The Lady Tigers are 14-7 and just outside state rankings. Their five-game win streak at the end of December and beginning of January is their longest, but they have not lost consecutive games since the second week of the season. Cushing (8-10): Tull 17, Guerrero 14, Hurst 9, Moyer 9, Melson 7, Ailey 7, Crooks 3.Cleveland (10-11): Cline 19, Edwards 19, Kruk 10, Baker 9, Seemore 6. Find Details on our Instagram page - Enter for a Chance to WIN!! @CushingHubApp!! CUSHING – The playoffs are five games away. For Cushing’s varsity boys basketball team, that’s five games to sharpen newly formed spears – in-bound plays, half-court sets, whatever coach Jontue Ezell places before them. Busby kept the Tigers in a plodding zone offense, letting Berlowitz pull defenders to the baseline while his guards set their arrows loose from the 3-point line. Berlowitz got open frequently, but the Tigers thrived from deeper shots, too. They had 27 points on 3’s, with Lola Nanaeto (20 points) accounting for four of those shots. The lead came easily enough with Cushing jumping out 7-0, then 12-0, then 15-0 midway through the first quarter on another 3-pointer from Nanaeto. Mannford (8-12) couldn’t get pressure on Cushing’s guards, and it didn’t score until the final 2 minutes of the first quarter. “It allowed us to get in a rhythm,” Busby said. “It lets us get our feet set, lets us observe and pick ‘em apart a little it, and it doesn’t hurt to come out and shoot 3’s like we did. That’s a big turnaround compared to Tuesday night.” Cushing played for the last shot at the half, finishing the possession with the ball in Berlowitz’s hands. She came off a screen from the far-right wing to sink a right-side 3-pointer with 2 seconds left. The Lady Tigers led 34-16 at the break. On Tuesday in Bristow, the girls won 28-21 in maybe the muddiest, most slow-going game of the season. Jontue Austin-Ezell is with Silas Guerrero. The Tigers struggled to keep up with an unbeaten Mannford team that has risen to No. 4 in the Class 4A rankings. With only 4 minutes left in the first quarter, Cushing’s Caleb Tull hit a quick-release 3-pointer to draw the score to 7-6, Mannford’s lead. It was a poor indicator of how this game would progress. While the Tigers (6-10) played a tight defense that sunk well inside the 3-point line, Mannford flexed it’s rapid ball movement and passing abilities and scored from all over the place. A little scoring spree in the second quarter pleased the home crowd and showed flashes of Ezell’s hard work thus far. Tyler Hurst scored an uncontested layup on a smartly done in-bound play from the baseline and the Tigers scored off a turnover on the next Mannford possession to draw the score to 30-17 with 4:08 left in the period, but a foul on the other end killed momentum. The Pirates (20-0) kept the lead around 15 for the rest of the half and didn’t give up that ground. Cushing will host Perkins-Tryon on Tuesday, Feb. 5. The girls game begins at 6:30 p.m. The Lady Tigers last played fourth-ranked Perkins-Tryon (19-1) Jan. 14 and lost 33-31. Cleveland, Sperry and Berryhill are the three final regular-season opponents. JONES – Braylyn Berlowitz’s senior season has the makings of a banner year.On Saturday, the 6-foot forward claimed her second all-tournament honor of the season and helped Cushing’s girls varsity basketball team to a third-place finish in the Jones Tournament. Berlowitz scores over 1000 points as a Lady TiGER! She has already eclipsed 1,000 points scored in her high school career and is part of a Cushing team that has ambitious playoff dreams this season under coach Brian Busby. This week in Jones, Berlowitz – the latest Ortho Oklahoma outstanding athlete – averaged 14 points per game, scoring 16, 16 and 11, respectively. The tournament began Thursday with the Lady Tigers’ stunning 53-33 victory against Class 3A Lindsay (7-11). Five players did all the scoring for Cushing in this three-game span: Berlowitz and Rachel Sherwood led in total points, and Lola Nanaeto, Ariya Reigner, Ashton Caulfield and Katelyn Carrier carried the rest of the load. The girls lost to Jones on Friday, 69-38, and came back Saturday afternoon to claim third place with a 39-24 win against Bethel. They hold an 11-6 record with a couple of home games left in the regular season. a 39-24 win against Bethel. They hold an 11-6 record with a couple of home games left in the regular season. In Locker room after eclipsing 1000 career points in third quarter of Berryhill game Tuesday night. Men’s team earn a 5th place showing in the Jones tournament for 2019. Get to know Coach Ezell’s background and family in this Part 1 Interview with RDMGtv. After losing in the first round, Cushing defeated Lindsay 54-44 and then the host-school Longhorns 61-51. That game marked their highest scoring total and largest margin of victory in the season. The Tigers travel to Bristow on Tuesday. Girls tip at 6 p.m., boys at 7:30. There are two homes games left this season, Feb. 5 against Perkins-Tryon and Feb. 8 against Cleveland. CLINTON – A memorable entry to 4A football came to a close Friday in Clinton as the Cushing Tigers fell 49-20 in the fist round of the high school football state playoffs. 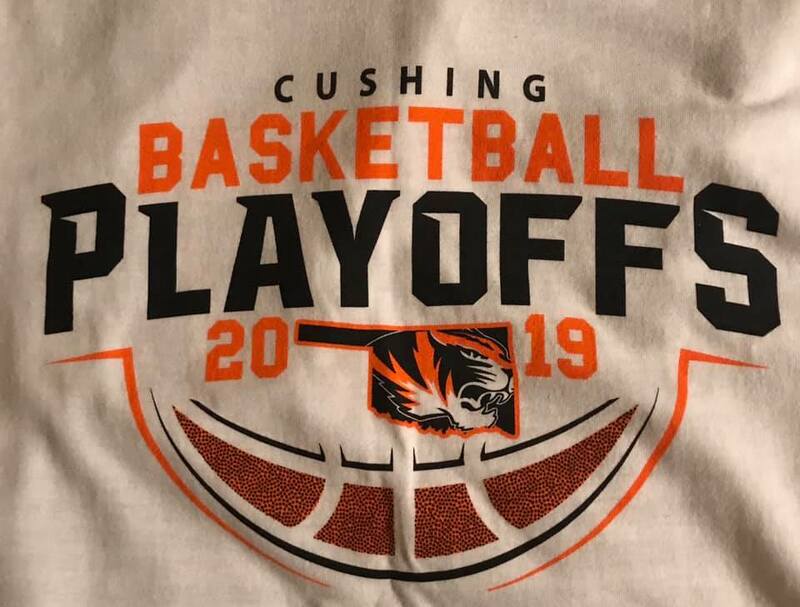 Moving into district 4A2 for the 2018-19 seasons, Cushing opened the year with a remarkably challenging three-game non-district slate and then inherited one of the toughest schedules in the state. The Tigers found their rhythm with a wildcat offense and an athletic defensive unit. Wil Moyer climbed to the top-5 of the Tulsa World’s quarterback leaderboard with nearly 2,400 passing yards. He led a menacing passing attack from the first kickoff of the season. Under first-year coach Rusty Morgan, the Tigers rebounded from an 0-3 start to win the first three district games and set up an entertaining run toward the playoffs. Clinton (10-1 overall) had too much staying power Friday night, rushing for 388 big-play yards as a team on just 40 plays from scrimmage. Morgan’s Tigers trailed 35-6 at halftime and struggled trying to climb out of that hole away from O’Dell Field. This game featured flashes of Cushing’s trademark plays throughout the year. Moyer found Keaton Crooks open on a quick route in the first quarter that turned into a 41-yard touchdown. Chance Kindley converted the point-after attempt. Trevor Ailey rushed for two touchdowns, including the two final scores of the game, and the Tigers completed a two-point conversion sneaking quarterback Dane Palmer into the lineup for a completion to Elijah Howell. Palmer’s first cameo under center came in Week 4 after Moyer suffered a leg injury late in the game against Berryhill. Working against an eager defense, Palmer was efficient in relief, completing three of his four passing attempts for 27 yards. Cushing didn’t have the same freedom moving the ball against Clinton, though. The Tigers were limited to an uncharacteristic 79 passing yards on 16 attempts. The season ends with four wins, seven losses and a winning 4-3 district mark. “The community (of Cushing) is unbelievable,” Morgan said. “Being from Cushing and always being around Cushing, the community comes together like none other. You can definitely feel the support and you can feel it all season long. RDMGtv got a close up look at the speech to the team from Coach Rusty Morgan, just following the game last Friday. Coach Morgan shows the team how to be a “TiGER” even after a tough loss to end the season, along with words of wisdom from the first year Head Coach. RDMGtv’s coverage of TiGER basketball & wrestling will be announced soon…..Stay up to date with the CushingHubApp! You can follow us on Instagram and Snapchat. TUTTLE – Playoffs, Tigers. Playoffs. Cushing trudged through a 49-14 loss at district 4A2-leading Tuttle on Friday night to end the regular season and set the stage for a first-round playoff game. At fourth place in the district, the Tigers (4-6 overall, 4-3 district) will travel to Clinton on Friday, Nov. 9. Tuttle forced a three-and-out on Cushing’s first drive and harassed the front line consistently. They even forced their way into the backfield to cause a harried, running punt on that drive. They carried the momentum to a 27-0 halftime lead. Cushing was ushered into Class 4A this season and placed into one of the toughest districts. The Tigers rebounded from a winless slate of three non-district games with a three-game win streak in which the offense averaged more than 40 points per game. The offense has shown it can fly high. In that three-game stretch in which Cushing rose to the top in the district, quarterback Wil Moyer threw for 114 yards, 259 yards, and 205 yards, respectively, with five total passing touchdowns in those games. It will be up to the offense to keep Clinton (9-1, 7-0) off its rhythm next week. Clinton has accrued 97 marginal district points, which is second most out of any 4A teams this season. Tiger fans will notice a faster path to state in Class 4A. It is a 16-team playoff rather than the 32-team format used in 3A. Kickoff is set for 7 p.m. in Clinton. Friday night’s game at Tuttle can be watched in its entirety online at RDMGtv.com, where fans can also find a postgame interview with Coach Morgan and highlights and bonus content from every game of the season. The Cushing Hub App provided by Red Dirt Media Group has led the way in local coverage of Cushing and its Tigers and will be on location as the playoffs begin Nov. 9. Power outtages in Tuttle disrupted some in-game services on the Cushing Hub App, but additional content will be available online throughout this weekend. RDMGtv is adding even more ways to connect with TiGER sports this next year. We are expanding our coverage in many different ways on social media, including more ways to interact with the CushingHubApp. Follow us on Instagram, Snapchat, Facebook and much more coming soon. Get exclusive content during the games, and contribute from your perspective. We appreciate ALL of our faithful viewers, and ALL of our sponsors making it possible to bring you coverage of TiGER Sports! Connect with the CushingHubApp on Instagram and Snapchat, and get “in the game”! CHS honored Senior at the last home game of the regular season Friday night. Here is RDMGtv’s coverage of Senior Night 2018. CUSHING – The Tiger offense took a step back Friday night as district 4A-2 contender Blanchard dominated its home turf for a 40-14 victory. Cushing (4-5 overall, 4-2 district) punted five times and turned the ball over twice Friday night on the road. Moyer found Nathan Jones open at the 23 yard line, and Jones beat a trail to the back of the end zone. Chance Kindley kicked the extra point. Cushing ran only 44 plays and came short of typical yardage production. The Tigers will travel to district-leading Tuttle (9-0, 6-0) Friday, Nov. 2 for the regular-season finale. Kickoff is set for 7:30 p.m.
Cushing has locked down playoff qualification, but how the Tigers finish this portion of the schedule determines where they will be sent for the first round. In their first season as 4A competitors, they have faced at least four tried-and-true playoff contenders. Tuttle, the next opponent, is undefeated and favored in 4A. “That’s a really, really good football team we just played, these are the types of teams you have to play to know where you stand,” Cushing coach Rusty Morgan said. “The message is going to stay the same, I challenge them to be consistent day in and day out. Consistency is the key, we know Tuttle is a great football team... we just have to understand the passing game and get better. Without an early deficit to rail against, this heralded Cushing offense soared. Quarterback Will Moyer completed 26 of 36 pass attempts for 367 yards and four passing touchdowns. He had no shortage of open, eligible receivers. Once this group of players have the ball in their hands, they are among the most difficult to stop in the district. Harrison Wood and Keaton Crooks each had six catches for 90 yards or more, and both scored a touchdown. Trevor Ailey, who piled on yet another remarkable individual performance, hauled in nine catches for 105 yards and two touchdowns. This week’s highlight reel is riddled with crafty passes from Moyer and smart, quick moves by receivers that buried Harrah in yards-after-the-catch. The Tigers were scoreless in the first quarter but trailed only 3-0 before hitting high gear. Harrah, winless through eight weeks, had three rushers reach 100 yards. Jeff Roberson led with 172, Chase Jackson had 140, and Gage Payne had 103. Cushing improved marginally on third down (5-for-8) and stopped Harah five times out of nine. Up next, the Tigers host Blanchard (6-2, 3-2) Friday at 7:30 p.m.
No qualifying answer were given this week,,,,,, Look for the next questions on game night next Friday VS Blanchard……Answer 7:30pm to Midnight! Get your name in the running for an iPAD mini this year. After 10 trivia questions a WINNER will be draw from all of those who answered a questions correctly. The more correct answers you have, the greater the chances to win the iPAD mini. CUSHING – Bethany bucked Cushing from the shoot Friday night and halted a three-game win streak for the hometown Tigers. The visiting Bronchos returned the opening kickoff 82 yards for a touchdown and then executed a 2-point conversion to stun Cushing and set up an important district 4A-2 win. Working with an early deficit, the Tigers continued to show off one of the best offenses in the district. Quarterback Wil Moyer completed 20 of 36 pass attempts for 222 yards and two touchdowns. His first scoring strike was maybe the play of the game for the Tigers, who were trailing 36-7 with 54 seconds left in the third quarter when Keaton Crooks light up the middle of the field. He got under a pass from Moyer on second down and 8 and took it 79 yards to the end zone. Chance Kindley made the extra point to draw the score to 36-14, and both teams had some scoring to do in the fourth quarter. Crooks had a banner night. He led Cushing with 10 catches for 155 yards and two touchdowns. The second one came in the fourth quarter, a six-yard connection. Harrison Wood caught a pass on the following two-point conversion attempt, but Cushing was still three scores away with 7:50 left. Bethany quarterback Sam Brandt accounted for 239 yards of offense. He was 8-13 for 165 yards passing and had almost no trouble running the ball as well, averaging 7.4 yards per carry. Cushing again struggled on third down, converting three out of 14 attempts and punting eight times. “The signs of great teams are that the capitalize on third downs, and they don’t get holding penalties that knock them back,” Morgan told RDMGtv’s James Coffelt. “We have to make progress, there’s no doubt about it. It’s a work in progress, we’ll work on it, and we’ll continue to get better at it. “We’ll come in Monday and be ready to go. I’m telling the guys everything we want to do is still ahead of us. All we want to do is get our name on the (state playoff) bracket at the end of the year and let the chips fall where they may.” Cushing is 3-4 overall with a 3-1 mark in district 4A-2, led by Tuttle and Bethany. Cushing High School band performed it’s competition show on Friday, preparing for the home stretch on marching band competition this season. Here are some clips of the show and interview with Dakota Norman (SR Drum Major) and Danny White Cushing Band Director. Weekly drawing winners, please check your email for details on collecting weekly drawing prizes…. Participate each week, on the CushingHubApp. Questions will open at 7:30pm to midnight each game night. Answer the questions correctly and be entered into the weekly and GRAND PRIZE drawings. October 10th, 2018 the president of the Federal Reserve Bank of Kansas City Esther George visited Cushing OK., to tour the Plains All American Pipeline facility located just south of Cushing. Her interest in the community and the facility was to learn first hand how the energy industry functions, and generates economic activity, in our area.. It seems mundane to those of us who live in the midst of the “tank farms”. We forget about the global impact our community has on a daily basis. However this is a good reminder that others are taking note of Cushing Oklahoma, and the significant contribution the energy industry has had in the past, and is guaranteed to have in the future. Red Dirt Media Group would like to thank Jerry Mackey and Brad Dooley for accommodating the request for the tour, and for being great hosts. Plains All American Pipeline and all of the energy producers are a true asset to our local community. CUSHING – The district race tightened Saturday afternoon as Cushing celebrated its third-straight victory to remain undefeated in 4A-2. By a score of 54-35, the Tigers improved to 3-3 overall and 3-0 in district as they defeated the McLoud Redskins. Will Moyer was again named the Red Dirt Sports Xtra MVP as he completed 19 of 29 pass attempts for 319 yards and four touchdowns. The Tigers produced 509 yards of offense to McLoud’s 289. The game was scheduled for Friday evening in McLoud but moved Saturday to Cushing after the tragic shooting death of a McLoud teenager. For the third week in a row, Cushing posted 27 first-half points and put itself in position to control the remaining 24 minutes of the game. Early points came on a pair of touchdown passes to Keaton Crooks (six catches, 84 yards), a pick-6 by Crooks, and a rushing touchdown from Trevor Ailey. McLoud (2-4 overall, 1-2 district) mostly matched Cushing’s pace. The Redskins cut the lead to 27-21 at halftime after scoring on three crucial possessions. They recovered from Crooks’ interception return with a nine-play, 54-yard scoring drive and a quick, four-play touchdown drive on the ensuing possession. In those two series, Cushing’s defense gave up conversions on third down and fourth down to leave the door open for McLoud. In the second half, McLoud started with the ball and began a methodical march toward tying the game. The Redskins rattled off 3 1/2 minutes before stalling out on fourth down to cap an eight-play drive. Cushing took over at its 32-yard line and Moyer, who was also named MVP after his performance in Perkins during Week 2, orchestrated one of the most important touchdowns of the afternoon. He was 5-for-5 for 71 yards on that drive, ending with a 9-yard pass to Harrison Wood that put the Tigers ahead 34-21 after Chance Kindley’s extra point. In the coming weeks, Cushing will have a chance to prove its mettle. Three teams from District 4A-2 have cracked the Tulsa World’s top-10 statewide rankings, and Cushing has all three of them still on the schedule. First, No. 5 Bethany. Then No. 7 Blanchard comes to town on Oct. 26. And finally Tuttle, the second-ranked team in 4A, will host Cushing for the regular season finale. Tuttle is undefeated. Combined, the three teams have only two losses. Cushing, however, has the upper hand on Bethany and Blanchard with a clean 3-0 district record. MADILL – As rain clouds threatened an already muddy field Saturday evening, Cushing’s Tigers brought the thunder. The Tigers delivered the first crushing blow of the high school football district schedule, beating Madill 40-13 on the road. 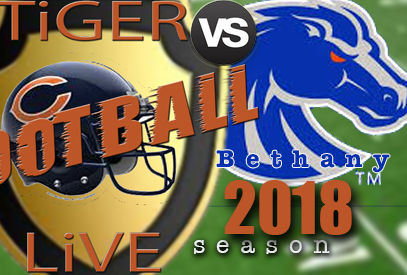 Click the graphic to watch the full game…..
Kickoff was postponed Friday and finally moved to Saturday as the grass playing surface in Madill soaked slowly. Coming off of a three game slide and a handful of small injuries, the Tigers (1-3 overall, 1-0 district 4A-2) needed a quick recovery Saturday night. “The way this season started 0-3, nobody wanted that, but they juts kept coming and grinding each day, and we got it done,” coach Rusty Morgan told RDMGtv’s James Coffelt. It all started with the steady performance of the offensive line. Senior left tackle Koby Floyd was named Red Dirt Sports Xtra MVP for his work on both sides of the line of scrimmage. Moyer returned from a deep bone bruise on his right leg and managed 4-for-6 passing for 114 yards and two touchdowns against the Wildcats. He also showed up to produce his longest pass play of the season, a stellar 66-yard pass and catch connection with Harrison Wood, who found the end zone to give the Tigers a 13-0 lead with 10:23 left in the second quarter. Chance Kindley kicked the extra point. Cushing scored on four of its first five possessions and created six turnovers on Madill’s first seven possessions. It was as lopsided a first half as the Tigers have experienced, and everything came up Black and Orange. The Tigers overcame 1-for-6 performance on third down and the loss of two fumbles Saturday night. Trevor Ailey carried the ball 12 times for 93 yards and two touchdowns, and Landon Kimmel ran 14 times for 91 yards and a score. Keaton Crooks and Champ Wright also scored. Madill scored once in the third quarter and once in the fourth, and the second PAT was blocked. The Wildcats (2-2, 0-1) ran 60 plays to Cushing’s 45 and ran for 291 yards, attempting only five passes. Cushing will host Tecumseh (2-2, 0-1) Friday at 7:20 p.m. Other district winners included McLoud, Tutle and Bethany. CUSHING – From Friday night’s opening possession, Cushing’s defense showed it was every bit the rival Berryhill hoped to avoid. The Tigers stuffed 3A Berryhill’s first drive inside the redzone with a fumble recovery, and at the end of the third quarter, they had limited the Chiefs to three scores and a 6-point lead. The gap grew too large for the Tigers to overcome, though. Berryhill prevailed 26-14 to bump Cushing’s record to 0-3. In the first half alone, the home crowd was treated to three turnovers. Champ Wright made the play on the opening fumble recovery, and Trevor Ailey came away with a fumble in the second quarter. Hunter Puls, joining the action, blocked a field goal attempt and scooped the loose ball 29 yards to Berryhill’s 48, leading to a touchdown just before halftime. In all, Cushing’s defense allowed only 182 rushing yards. Berryhill’s Cody Ross was 16 of 19 passing for 300 yards and one passing TD. The Cushing offense changed looks a time or two. Starting quarterback Wil Moyer suffered an apparent leg injury in the fourth quarter and sophomore receiver Dane Palmer took his place in the shotgun formation. Moyer was 19-of-42 passing for 201 yards and two TDs in three and a half quarters of play. He strung together a handful of gritty drives, including a series that started after Puls’ blocked field goal. With the ball inside Chiefs territory, Moyer found Nathan Jones and Keaton Crooks for first-down conversions of 17 and 22 yards, including Crooks’ catch in the corner of the end zone as time expired. That drew the halftime score to 14-7 in Berryhill’s favor. Cushing’s other score was from a five-play, 47-yard drive that began after the defense forced a turnover on downs. Again, with the ball in Beryhill’s territory, Cushing was knocking on the door. Moyer found Jones on third and 7 from the 44-yard line and Jones scooted for a 14-yard conversion. Harrison Wood then caught a 9-yard TD pass from Moyer on a bootleg and tied the game at 14 with 7:12 left in the third quarter. Berryhill (3-0) scored once in each quarter. Palmer inherited an aggressive playbook. He completed three of four pass attempts for 27 yards. His signature play of the night came on fourth and 12 from the Tigers’ 40 yard line. On that play, the sophomore tilted his pads and let a tight spiral fly toward the near sideline, where Crooks reached out to complete a 40-yard pass and catch. It was brought back by penalties, but the Tigers got a good look at the player who could resume quarterback duties for the near future. Next week, the Tigers travel to Madill for the District 4A-2 opener. Kickoff is set for 7:30 p.m.
PERKINS – The longest drive in Cushing’s 23-0 loss to Perkins-Tryon on Friday night came at the aid of a few defensive penalties. In that 12-play series, the Tigers showed the ability to move the ball as well as they’ll need to in the fast-approaching District 4A-2 schedule. But there were also a handful of offensive penalties on that drive, and that balance of youth and experience has coach Rusty Morgan hopeful for next week’s game against 3A Berryhill. There were a few notable performances in Friday night’s loss despite a bevy of penalties and four turnovers. Wil Moyer brought another gutsy performance to the gridiron as he persisted through wearisome weather. Winds swirled mist and light rain through football stadiums all across Green Country on Friday night, making it an unfriendly day for quarterbacks. Moyer, however, was again the sharpest signal caller on the field as he completed 13 of 26 pass attempts for 137 yards. Again, Keaton Crooks led the wide receivers with five catches for 88 yards, including the game’s longest, a 36-yard play on third-down and long in the fourth quarter.That drive was crushed inside Perkins’ redzone as the Demon Deacons came away with an interception. Moyer to Ailey for 36 yards. TiGERS take the field next Friday night at 7:30 p.m. hosting the Berryhill Chieftons. CUSHING – A nearly unthinkable comeback bid grew steadily Friday night as the Cushing Tigers displayed their intent to stoke a decades-old rivalry. The Tigers lost 60-39 to the Bristow Pirates in their Class 4A debut, but not before staging a wild first-half rally. Cushing’s Keaton Crooks, a leading junior receiver, laid claim to maybe the best individual performance of the night. He was named the Red Dirt Sports Xtra MVP for his work on the edge of the offense. Crooks hauled in 12 catches for 166 yards, as well as a defensive interception, scored two touchdowns, and recorded eight tackles for the Tigers. The Tigers (0-1) scored 21 unanswered points in the second quarter and dragged Bristow to the wire, threatening to tie the game with 6 seconds left in the first half, though time ran out before they could tie it. Evan Kennedy scored first with a four-yard pass from Moyer. Then Trevor Alley, making defenders miss on a 21-yard pass play. Crooks scored the next two. “Of course, some other things didn’t go our way, but the biggest positive is the way we responded all night long,” Morgan said. “We continued to string drives together, (quarterback) Wil Moyer is throwing it around excellently, and the line protected him all night long.” With a 28-21 lead, Bristow outscored Cushing 32-18 in the second half as the Pirates racked up 601 yards of offense and punted only twice. Moyer, however, had an astounding night as he connected with Crooks and others for an impressive stat line. He completed 37 of 62 pass attempts for 476 yards and six TDs. Watch The Bank Of Cushing "Post Game Interview"
The longest scoring play of the night came in the form of an 85-yard pass play from Moyer to Nathan Jones, who tallied 137 yards on six catches. This was the Core Civic "Play Of The Game." Watch the Core Civic "Play of the Game"
Defensively, Cushing struggled to catch Bristow’s ball carriers. The Pirates had little interest in the passing game as they tallied more than 500 rushing yards and called only nine pass plays. “Defensively, it was not as nice as we would like it to be, but we’re gonna get better,” Morgan said. The Tigers return to the field Friday, Sept. 7 as they travel to 3A Perkins for a 7 p.m. kickoff. Do you know where Park Place Baptist Church is located? If you do not, or don't remember, it's a great little church over on the North West side of Cushing. Not on a main street or even in more visible area like downtown Cushing, but strategically placed right in the midst of the surrounding neighborhood. Vic and Sylvia Morelan have taken on the interim pastorate at Park Place Baptist. If you don't know who Vic and Sylvia are...you should. They are two of the nicest people you will ever meet, And they both have the heart of a pastor. What does that mean? It means that even at an age when most people have been retired for years, Vic and Sylvia still feel the desire to reach people of this community for Christ. They have been out walking the neighborhood around the church asking people to come and visit, and spreading the Gospel to ALL who will listen. "It's inspirational to me" stated Debbie Morris, new to the congregation at Park Place. The push to reinvigorate the church has fallen directly on the shoulders of Vic and Sylvia. Not wasting any time complaining about what the don't have, they just got to work doing what they know to do. Sharing the Love of God to everyone they come in contact with. Held in the Fellowship Hall at 321 N Hartman - Bring you family and be blessed! Pastor Vic, who is an avid photographer, uses his skill and passion with a camera to breach the conversation with everyone he comes in contact with daily. Some may find it strange at first, that somebody wants to get your picture. But he has a way of convincing you to gladly pose for the shot. Vic makes sure he can find you again to deliver the print and put it in your hands. All the while talking to you about your wellbeing, your circumstance, or situation. Putting you squarely in the center of his concern, even at least for just a little bit. You walk away with the feeling of a unique experience, and feeling good that somebody cared enough to sincerely ask about you. Vic and Sylvia would never ask to have the spotlight put on them, but it certainly is deserved. Seeing true pastors, that truly care about the people of this community, can be rare. If you would like more information about the clothing giveaway, call the church @ (918) 225-3941. A group of concerned Oklahoman's have become aware of an issue that has them taking action. Property owners report that they have been approached to sell rights to the Wind Catcher Project, to construct massive 765 kilowatt transmission line towers across their land. The Oklahoma Corporation Commission has been discussing the pro's and con's of the issue, and may make a ruling on the project next week, concerned citizens tell RDMGtv. Those voicing opposition are not only the property owners in Oklahoma, but citizens that see issues with other risks they say could cause health issues. Here is a short video that explains some of the concerns. Rob Dixon who points us to, www.NoWindCatcher.com has been opposed to the project for some time. He tells RDMGtv that the Oklahoma Corporation Commission wants to hear and get feed back from Oklahoman's on how they feel about the transmission lines being built here in our state. View this message from Former Govenor Frank Keating on Oklahoma and wind energy. As Oklahoman's learn more about the facts of the project, opposition seems to be coming from all sides. However, those opposed to the project say it is not enough to just assume the corporation commissioners know there is growing opposition to the Wind Catcher Project. Concerned Citizens of Wind Catcher want to recruit you, the citizens of Oklahoma, "to make your voice heard." Tell them NO to the Wind Catcher Project in Oklahoma!